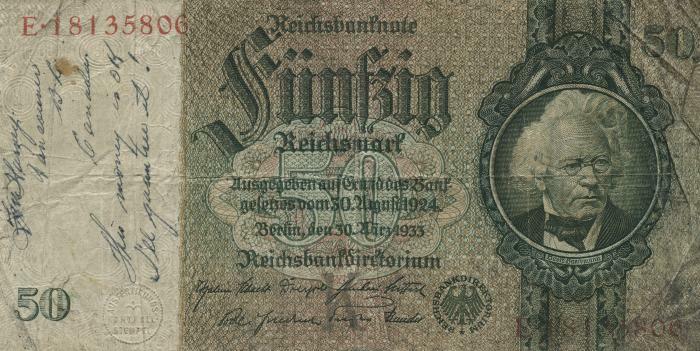 Description50 mark Reichsbanknote printed in green and red ink on white paper. Denominations and serials numbers on both sides. Handwritten message on recto. Note is creased from being folded and very worn. InscriptionsRecto: [From?] Harvey / Vancouver / B.C. / Canada / This money is OK / I'll guarantee it! ProvenanceGifted to the Vancouver Holocaust Education Centre in 1993 by Joe Leibl. The donor served in the Canadian Army during the Second World War and acquired the currency in Germany.